Leather is a durable and flexible material created by the tanning of animal rawhide and skin, often cattle hide. It can be produced through manufacturing processes ranging from cottage industry to heavy industry. Leather is used for various purposes including clothing (e.g. shoes, hats, jackets, skirts, trousers and belts), bookbinding, leather wallpaper, and as a furniture covering. It is produced in a wide variety of types and styles and is decorated by a wide range of techniques. Vegetal-tanned leather is tanned using tannins and other ingredients found in different vegetable matter, such as tree bark prepared in bark mills, wood, leaves, fruits and roots and other similar sources. It is supple and brown in color, with the exact shade depending on the mix of chemicals and the color of the skin. It is the only form of leather suitable for use in leather carving or stamping. Vegetal-tanned leather is not stable in water; it tends to discolor, so if left to soak and then dry it will shrink and become less supple, and harder. In hot water, it will shrink drastically and partly congeal, becoming rigid and eventually brittle. Boiled leather is an example of this, where the leather has been hardened by being immersed in hot water, or in boiled wax or similar substances. Historically, it was occasionally used as armour after hardening, and it has also been used for book binding. Aldehyde-tanned leather is tanned using glutaraldehyde or oxazolidine compounds. This is the leather that most tanners refer to as wet-white leather due to its pale cream or white color. It is the main type of "chrome-free" leather, often seen in automobiles and shoes for infants. Formaldehyde tanning (being phased out due to its danger to workers and the sensitivity of many people to formaldehyde) is another method of aldehyde tanning. Brain-tanned leathers fall into this category and are exceptionally water absorbent. Brain tanned leathers are made by a labor-intensive process which uses emulsified oils, often those of animal brains such as deers,cows, and buffaloes. They are known for their exceptional softness and their ability to be washed. Chamois leather also falls into the category of aldehyde tanning and, like brain tanning, produces a porous and highly water-absorbent leather. Chamois leather is made by using marine oils (traditionally cod oil) that oxidize easily to produce the aldehydes that tan the leather to make the fabric the color it is. Rose tanned leather is a variation of vegetable oil tanning and brain tanning, where pure rose otto replaces the vegetable oil and emulsified oils. Rose tanned leather tanned using rose otto oil leaves a powerful rose fragrance even years from the day it is manufactured. It has been called the most valuable leather on earth, but this is mostly due to the high cost of rose otto and its labor-intensive tanning process. Synthetic-tanned leather is tanned using aromatic polymers such as the Novolac or Neradol types (syntans, contraction for synthetic tannins). This leather is white in color and was invented when vegetable tannins were in short supply during the Second World War. Melamine and other amino-functional resins fall into this category as well, and they provide the filling that modern leathers often require. Urea-formaldehyde resins were also used in this tanning method until dissatisfaction about the formation of free formaldehyde was realized. Alum-tanned leather is transformed using aluminium salts mixed with a variety of binders and protein sources, such as flour and egg yolk. Alum-tawed leather is technically not tanned, as tannic acid is not used, and the resulting material will revert to rawhide if soaked in water long enough to remove the alum salts. Rawhide is made by scraping the skin thin, soaking it in lime, and then stretching it while it dries. Like alum-tawing, rawhide is not technically "leather", but is usually lumped in with the other forms. Rawhide is stiffer and more brittle than other forms of leather; it's primarily found in uses such as drum heads and parchment where it does not need to flex significantly; it is also cut up into cords for use in lacing or stitching and for making many varieties of dog chews. Leather; usually vegetal-tanned, can be oiled to improve its water resistance. 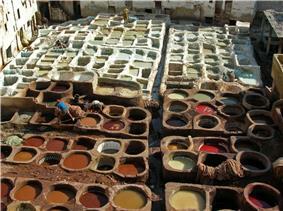 This currying process after tanning supplements the natural oils remaining in the leather itself, which can be washed out through repeated exposure to water. Russia leather was an important international trade good for centuries. Frequent oiling of leather, with mink oil, neatsfoot oil, or a similar material keeps it supple and improves its lifespan dramatically. Full-grain leather refers to hides that have not been sanded, buffed, or snuffed (as opposed to top-grain or corrected leather) to remove imperfections (or natural marks) on the surface of the hide. The grain remains allowing the fiber strength and durability. The grain also has breathability, resulting in less moisture from prolonged contact. Rather than wearing out, it will develop a patina over time. High quality leather furniture and footwear are often made from full-grain leather. Full-grain leathers are typically available in two finish types: aniline, semi-aniline. Top-grain leather (the most common type used in high-end leather products) is the second-highest quality. It has had the "split" layer separated away, making it thinner and more pliable than full-grain. Its surface has been sanded and a finish coat added to the surface which results in a colder, plastic feel with less breathability, and it will not develop a natural patina. It is typically less expensive and has greater resistance to stains than full-grain leather, so long as the finish remains unbroken. Corrected-grain leather is any leather that has had an artificial grain applied to its surface. The hides used to create corrected leather do not meet the standards for use in creating vegetal-tanned or aniline leather. The imperfections are corrected or sanded off, and an artificial grain embossed into the surface and dressed with stain or dyes. Most corrected-grain leather is used to make pigmented leather as the solid pigment helps hide the corrections or imperfections. Corrected grain leathers can mainly be bought as two finish types: semi-aniline and pigmented. Split leather is leather created from the fibrous part of the hide left once the top-grain of the rawhide has been separated from the hide. During the splitting operation, the top-grain and drop split are separated. The drop split can be further split (thickness allowing) into a middle split and a flesh split. In very thick hides, the middle split can be separated into multiple layers until the thickness prevents further splitting. Split leather then has an artificial layer applied to the surface of the split and is embossed with a leather grain (bycast leather). Splits are also used to create suede. The strongest suedes are usually made from grain splits (that have the grain completely removed) or from the flesh split that has been shaved to the correct thickness. Suede is "fuzzy" on both sides. Manufacturers use a variety of techniques to make suede from full-grain. A reversed suede is a grained leather that has been designed into the leather article with the grain facing away from the visible surface. It is not considered to be a true form of suede. Buckskin or brained leather is a tanning process that uses animal brains or other fatty materials to alter the leather. The resulting supple, suede-like hide is usually smoked heavily to prevent it from returning to a rawhide state, if wetted. It will be easier to soften, and will help keep leather eating bugs away. Fish Leather : leather popular for its motifs and its pigmentation. 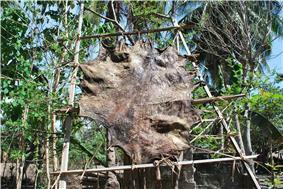 Mainly used for making shoes and bags, the fish skin is tanned like other animal skins. The species used include salmon, perch, sturgeon, etc. Salmon : farmed in Iceland and Norway, salmon skin has fine scales. Its strength and elegant look make it the most popular fish leather. Perch : coming from Nile, its skin is recognizable with its large, round and soft scales. Wolffish : its skin is smooth because without scales. We recognize it thanks to its dark spots, and the 'stripes' which are due to the friction of marine rocks. Cod : its skin has finer scales than salmon, but its texture is more varied, sometimes smooth and sometimes rough. Sturgeon : fish well known for its eggs (caviar), which make it rare. Its leather is thus quite expensive. Eel : fish without scales, its skin has a shiny appearance. Tilapia : compared with salmon skins the patterns of tilapia leather is more beautiful, but the skins are smaller. The leather has resistant qualities similar to salmon and perch. Tilapia originate from Africa, and are farmed in many tropical countries. It is a popular food fish and is considered an invasive species in much of the United States. Shagreen is also known as stingray skin/leather. Applications used in furniture production date as far back as the art deco period. 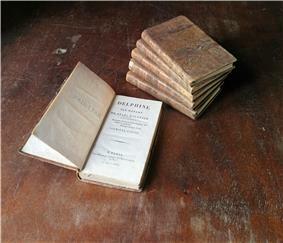 The word "shagreen" originates from France. It's known as the most difficult leather to work due to dished scales of the animal, and it is one of the most expensive leathers. Shark : its skin is covered with small, close-set tubercles, making it very tough. The handbags made of shark skin used to be in vogue but this keen interest has since fallen as the costs of production and of the leather itself are very high. Moreover, this skin is more difficult to work. Should not be confused with traditional "sharkskin", a woven textile product. Deerskin is a tough leather, possibly due to the animal's adaptations to its thorny and thicket-filled habitats. Deerskin has been used by many societies, including indigenous Americans. Most modern deerskin is no longer procured from the wild, with deer farms breeding the animals specifically for the purpose of their skins. Large quantities are still tanned from wild deer hides in historic tanning towns such as Gloversville and Johnstown in upstate New York. Deerskin is used in jackets and overcoats, martial arts equipment such as kendo and bogu, as well as personal accessories such as handbags and wallets. Russia leather is a particular form of bark-tanned cow leather. It is distinguished by an oiling step, after tanning, where birch oil is worked into the leather to make it particularly hard-wearing, flexible and resistant to water. Belting leather is a full-grain leather that was originally used in driving pulley belts and other machinery. It is found on the surface of briefcases, portfolios, and wallets, and can be identified by its thick, firm feel and smooth finish. Belting leather is generally a heavy-weight of full-grain, vegetal-tanned leather. latex on top of a fiber sheet. The varying degree of organic leather in the mix (between 10% and 90%) affects the smell and the texture of such product. Due to its reduced cost it is becoming a popular choice for furniture upholstery, especially for commercial use, where durability is needed; however durability can vary widely, depending on the formulation. Bycast leather is a split leather with a layer of polyurethane laminated to the surface and then embossed. Bycast was originally made for the shoe industry and later adopted by the furniture industry. The original formula created by Bayer was strong but expensive. The result is a material that is slightly stiffer but cheaper than top-grain leather but has a much more consistent texture. Because its surface is completely covered in plastic, is easier to clean and maintain, but is not easily repaired. Today most leather is made of cattle skin but many exceptions exist. Lamb and deerskin are used for soft leather in more expensive apparel. Deer and elkskin are widely used in work gloves and indoor shoes. Pigskin is used in apparel and on seats of saddles. Buffalo, goats, alligators, snakes, ostriches, kangaroos, oxen, and yaks may also be used for leather. Kangaroo skin is used to make items which need to be strong but flexible, it is the material most commonly used in bullwhips. Kangaroo leather is favored by some motorcyclists for use in motorcycle leathers specifically because of its light weight and abrasion resistance. Kangaroo leather is also used for falconry jesses, soccer footwear, and boxing speed bags. At different times in history, leather made from more exotic skins has been considered desirable. For this reason certain species of snakes and crocodiles have been hunted. Although originally raised for their feathers in the 19th century, ostriches are now more popular for both meat and leather. There are different processes to produce different finishes for many applications, i.e., upholstery, footwear, automotive products, accessories, and clothing. 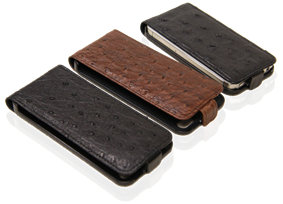 Ostrich leather is currently used by many major fashion houses such as Hermès, Prada, Gucci, and Louis Vuitton. Ostrich leather has a characteristic "goose bump" look because of the large follicles from which the feathers grew. In Thailand, sting ray leather is used in wallets and belts. Sting ray leather is tough and durable. The leather is often dyed black and covered with tiny round bumps in the natural pattern of the back ridge of an animal. These bumps are then usually dyed white to highlight the decoration. Sting ray rawhide is also used as grips on Chinese swords, Scottish basket hilted swords and Japanese katanas. The leather manufacturing process is divided into three fundamental sub-processes: preparatory stages, tanning, and crusting. All true leathers will undergo these sub-processes. A further sub-process, surface coating, can be added into the leather process sequence, but not all leathers receive surface treatment. Since many types of leather exist, it is difficult to create a list of operations that all leathers must undergo. Tanning is the process which matches the protein of the raw hide or skin into a stable material which will not putrefy and is suitable for a wide variety of end applications. The principal difference between raw hides and tanned hides is that raw hides dry out to form a hard inflexible material that when re-wetted (or wetted-back) putrefy, while tanned material dries out to a flexible form that does not become putrid when wetted-back. Many different tanning methods and materials can be used; the choice is ultimately dependent on the end application of the leather. The most commonly used tanning material is chromium, which leaves the leather, once tanned, a pale blue color (due to the chromium); this product is commonly called "wet blue". The hides once they have finished pickling will typically be between pH 2.8 and 3.2. At this point, the hides would be loaded in a drum and immersed in a float containing the tanning liquor. The hides are allowed to soak (while the drum slowly rotates about its axle) and the tanning liquor slowly penetrates through the full substance of the hide. Regular checks will be made to see the penetration by cutting the cross-section of a hide and observing the degree of penetration. Once an even degree of penetration exists, the pH of the float is slowly raised in a process called basification. This basification process fixes the tanning material to the leather and the more tanning material fixed, the higher the hydrothermal stability and increased shrinkage temperature resistance of the leather. The pH of the leather when chrome tanned would typically finish somewhere between 3.8 and 4.2. Crusting is the process by which the hide/skin is thinned, retanned, and lubricated. Often a coloring operation is included in the crusting subprocess. The chemicals added during crusting must be fixed in place. The culmination of the crusting subprocess is the drying and softening operations. Crusting may include the following operations: wetting-back, sammying, splitting, shaving, rechroming, neutralization, retanning, dyeing, fatliquoring, filling, stuffing, stripping, whitening, fixating, setting, drying, conditioning, milling, staking, and buffing. air pollution due to the transformation process (hydrogen sulfide during dehairing and ammonia during deliming, solvent vapors). Leather biodegrades slowly; it takes 25 to 40 years to decompose. However, vinyl and petro-chemical derived materials will take 500 or more years to break down and return to the earth. One ton of hide or skin generally leads to the production of 20 to 80 m3 of wastewater including chromium levels of 100–400mg/L, sulfide levels of 200–800mg/L and high levels of fat and other solid wastes, as well as notable pathogen contamination. Pesticides are also often added for hide conservation during transport. With solid wastes representing up to 70% of the wet weight of the original hides, the tanning process comes at a considerable strain on water treatment installations. Tanning is especially polluting in countries where environmental regulations are lax, such as in India, the world's third-largest producer and exporter of leather. To give an example of an efficient pollution prevention system, chromium loads per produced tonne are generally abated from 8kg to 1.5kg. 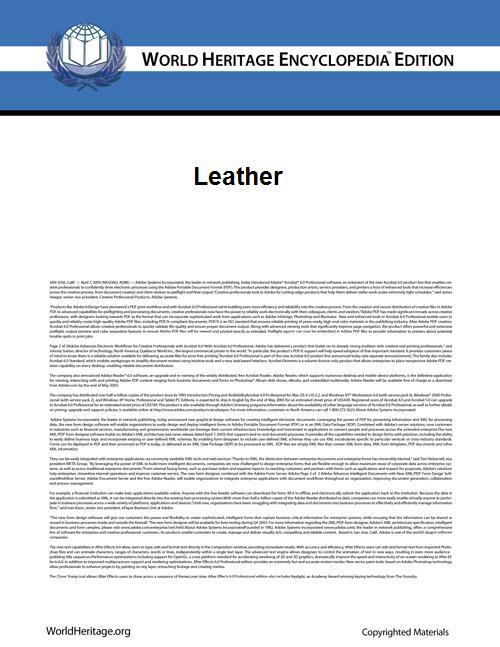 ^ "IULTCS Glossary of Leather Terms". Retrieved 15 June 2010. ^ "NAS - Nonindigenous Aquatic Species". USGS. Retrieved 10 June 2014. ^ "FAQ". Dainese. Retrieved 2010-10-05. ^ Lat, Will. "Soccer Cleats". Retrieved 10/3/2012. ^ "What type of Leather do I have?". Soccer Cleats 101. Retrieved 2010-07-27. ^ "Everlast Premium Kangaroo Leather Speed Bag". Everlast. Retrieved 2013-10-20. ^ "Pollution Prevention and Abatement Handbook - Environmental Guidelines for Tanning and Leather Finishing". Multilateral Investment Guarantee Agency, World Bank Group. Retrieved 2010-01-02. ^ "The scope for decreasing pollution load in leather processing (US/RAS/92/120/11-51)". United Nations Industrial Development Organization Regional Programme for Pollution Control in the Tanning Industry in South-East Asia. 2000-08-09. Retrieved 2010-01-02. ^ "How much time needed to check tanneries' waste". Times of India. 2009-07-11. Retrieved 2010-01-02. ^ "Kanpur: chromium disaster". Clean Ganga - Campaign for a cleaner Ganga. June 2003. Retrieved 2010-01-02. ^ "Introduction of Low Pollution Processes in Leather Production". EcoLinks. 2001. Retrieved 2010-01-02. ^ "Uganda: leather factory faces closure over pollution". The Monitor. 2009-11-05. Retrieved 2010-01-02. ^ Heidemann, E. (1993). 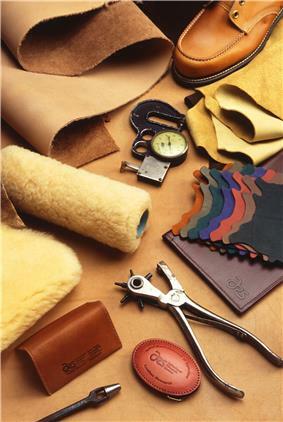 Fundamentals of Leather Manufacture. Eduard Roether KG. p. 211. ^ Bienkiewicz, K. (1983). Physical Chemistry of Leather Making. Robert E. Krieger. p. 226. ^ "How to Clean and Condition Leather". November 27, 2014. Retrieved 27 November 2014. ^ a b John Mumford. "Understanding and Caring for Bookbindings". The British Library. Retrieved 6 October 2010. ^ Mary Fahey. "The Care and Preservation of Archival Materials". ^ a b "Leather Dressing". Library of Congress. Retrieved 2008-04-05. ^ a b "Leather Dressing: 'To Dress or not to Dress' National Park Service Conserve O Gram, Vol.9, No.1, 2004-12". Society of Rocky Mountain Archivists. Retrieved 2008-04-05. ^ McCrady, Ellen. "Research on the Dressing and Preservation of Leather. Abbey Newsletter, Vol. 5 No. 2, 1981-04.". palimpsest.stanford.edu. Retrieved 6 October 2010. ^ "Wearing Shoes - Mourning Observances of Shiva and Sheloshim". Chabad.org. Retrieved 2009-10-20. Many pseudo-leather materials have been developed. Some published claims assert that certain versions of artificial leather are stronger than real leather when manufactured with strength in mind. Ranges of synthetic polymeric materials provide features rivalling or exceeding those of various types of leather in particular applications; they include vegan microfiber, pleather and Naugahyde. Some vegetarians, vegans and animal rights activists such as PETA, boycott all leather products, arguing that the use of leather is unjustifiable. They encourage the use of alternative materials such as synthetic leathers. Jainism prohibits the use of leather since it is obtained by killing animals. Many cars and trucks come with optional or standard "leather" seating. These days most car manufacturers due to consideration of durability and cost use synthetic PU leather, including luxury car brands like Mercedes-Benz, BMW, and Audi. Many rock groups (particularly heavy metal and punk groups in the 1980s) are well known for wearing leather clothing. 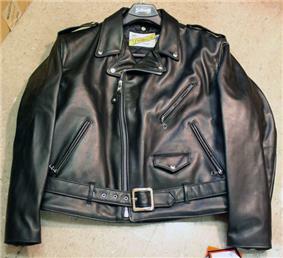 Leather clothing, particularly jackets, are common in the heavy metal and Punk subculture. Extreme metal bands (especially black metal bands) and Goth rock groups have extensive leather clothing. Due to its excellent resistance to abrasion and wind, leather found a use in rugged occupations. The enduring image of a cowboy in leather chaps gave way to the leather-jacketed and leather-helmeted aviator. When motorcycles were invented, some riders took to wearing heavy leather jackets to protect from road rash and wind blast; some also wear chaps or full leather pants to protect the lower body. Top-quality motorcycle leather is superior to any practical man-made fabric for abrasion protection and is still used in racing. Many sports still use leather to help in playing the game or protecting players; its flexibility allows it to be formed and flexed. The related term Cuir de Cordoue refers to painted and gilded (and sometimes embossed) leather hangings manufactured in panels and assembled for covering walls as an alternative to tapestry. Cordwain, once a synonym of cordovan (through Old French cordewan) meaning "from Córdoba" describes a certain kind of fine leather, originally from Córdoba. Cordwainer is still used to describe someone in the profession of shoemaking. The debate on the use of dressings for preservation of book bindings has spanned several decades as research and experimental evidence have slowly accumulated. The main argument is that, done incorrectly, there are multiple disadvantages and that, done correctly, there is little to no preservation advantage. Pamphlets and guidelines give numerous downsides to dressings use, including: the dressing becoming increasingly acidic and will discolor and stain the leather, oxidize (penetration and expansion of oils including displacement and weakening of fibers) and stiffen, leave a sticky surface, collect dust, wick into adjacent materials, form unstable surface spews, encourage biological deterioration and mold growth, block surface porosity, impede further treatment, wet and swell the leather, affect surface finishes, and desiccate or dry out the leather. Meanwhile, scientific experiments have shown no substantial benefits. The main authorities on the subject therefore discourage it, with a caveat for special cases done under the direction of a conservator. Various treatments are available such as conditioners, but these are not recommended by conservators since they impregnate the structure of the leather artifact with active chemicals, are sticky, and attract stains. Saddle soap is used for cleaning, conditioning and softening leather. Leather shoes are widely conditioned with shoe polish. The natural fibers of leather will break down with the passage of time. Acidic leathers are particularly vulnerable to red rot, which causes powdering of the surface and a change in consistency. Damage from red rot is aggravated by high temperatures and relative humidities and is irreversible. Proteases are the most commonly used enzymes in leather production. The enzyme used should not damage or dissolve collagen or keratin, but should be able to hydrolyze casein, elastin, albumin, and globulin-like proteins, as well as non-structured proteins which are not essential for leather making. This process is called bating. Enzymes like proteases, lipases, and amylases have an important role in the soaking, dehairing, degreasing, and bating operations of leather manufacturing. No general study seems to exist but the current news is rife with documented examples. In November 2009 for instance, it was discovered that one of Uganda's main leather producing companies directly dumped its waste water in a wetland adjacent to Lake Victoria. The higher cost associated with the treatment of effluents than to untreated effluent discharging leads to illegal dumping to save on costs. For instance, in Croatia in 2001, proper pollution abatement cost 70-100 USD/t of raw hides processed against 43 USD/t for irresponsible behavior. In the Hazaribagh neighborhood of Dhaka in Bangladesh, chemicals from tanneries end up in Dhaka's main river. Besides the environmental damage, the health of both local factory workers and the end consumer is also negatively affected. Besides local sales of products made with leather from the Hazaribagh neighborhood of Dhaka, the leather is also bought by huge Western companies and sold in the developed world. In Kanpur, the self-proclaimed "Leather City of World" with 10,000 tanneries as of 2011 and a city of 3 million people on the banks of the river Ganges, pollution levels were so high that despite an industry crisis, the pollution control board has decided to seal 49 high-polluting tanneries out of 404 in July 2009. In 2003 for instance, the main tanneries' effluent disposal unit was dumping 22 tonnes of chromium-laden solid waste per day in the open. Scientists at the Central Leather Research Institute in India have developed biological methods for pretanning as well as better chromium management.